This year’s Sydney Morning Herald Sun Run saw Kirribilli Runners enter 16 entrants in the 10km and 7km events. With three runners withdrawing from the 10km, a total of 11 competed in the longer distance, while two competed over the 7km. 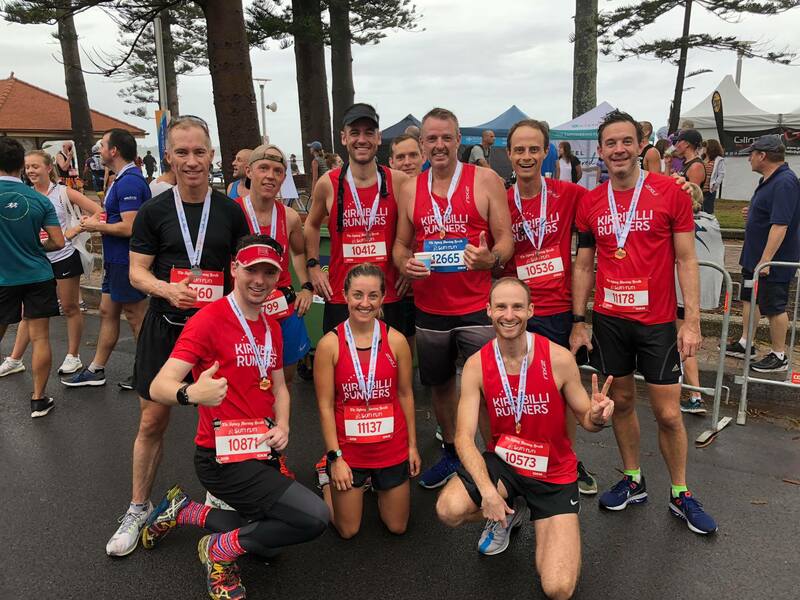 The Sun Run’s 10km course is a notoriously hilly affair, with somewhere between 100 and 120m elevation over the undulating Dee Why and Manly streets. That’s an average of more than 10 metres of climbing per kilometre. Two big hills dominate the race, and the first appears almost immediately at the startline, stretching skywards for about 600m. The second hill appears just before the 7km mark and drags up for the better part of that kilometre. Mercifully, it’s all downhill after the 8th kilometre, and it bottoms out to a nice flat finish over the final thousand metres. The Sun Run 10km elevation profile. Despite the challenging nature of the course, the race allowed our team to produce a myriad of notable performances, including multiple personal bests. Perhaps most impressively, our team of 11 runners came third overall in the 10km, with scoring team members Anthony Slaven (39.03), Josh Marks (39.22), and Ben Weston (43.20) all hitting very solid marks over the bumpy route. Weston’s time was a PB of about 30 seconds, while Marks, who has rarely run the 10km distance, put a solid sub-40 on the board. Our best-placed runner, Anthony Slaven, was only a few seconds shy of a sub-39. Many other runners ran personal bests, with Dan Leahey running his first sub-45 in a comfortable 43.24, and Mark McEntee running strongly to miss the 45-minute mark by only 3 seconds. Dan Leahey bringing it home. Anna Watterson kept the 45-minute pacers company for most of the race, running valiantly in the tough conditions to achieve an official PB of more than a minute, with a 10km mark of 46.31. Watterson’s previous PB (unofficial) was in the 47–48 minute range. Other KR competitors all ran well, with Karl Hosking, Caitlin Pitt, and Chris Charlton all bringing it home under 50 minutes. James Maguire ran strongly, coming home near the hour mark in 62.40. Richard Halliwell and Brett Jamieson were also unofficial KR runners, with both running good times on the day. Long-time KR Sonia was on hand to capture footage of our team finishers (below). Another notable performance came from debut racer Danielle Kroon, who ran a respectable 48.19 over the 7km race after running her longest run ever — of about 8km — only about a fortnight before the Sun Run! As is customary, we had a luxurious breakfast to finish.